Stopping along Loyalsock Creek while backpacking the Loyalsock Trail, Pa.
New photos are posted at the homepage (www.davepidgeon.net) with focus on a 2003 trip to cover a humanitarian mission in the Dominican Republic and some of my favorite pics from various backpacks through Pennsylvania. The DR photos are here and the Pennsylvania pics are here. I found myself going through the Pennsylvania pics lamenting about a lack of enthusiasm for Pennsylvania backpacks. 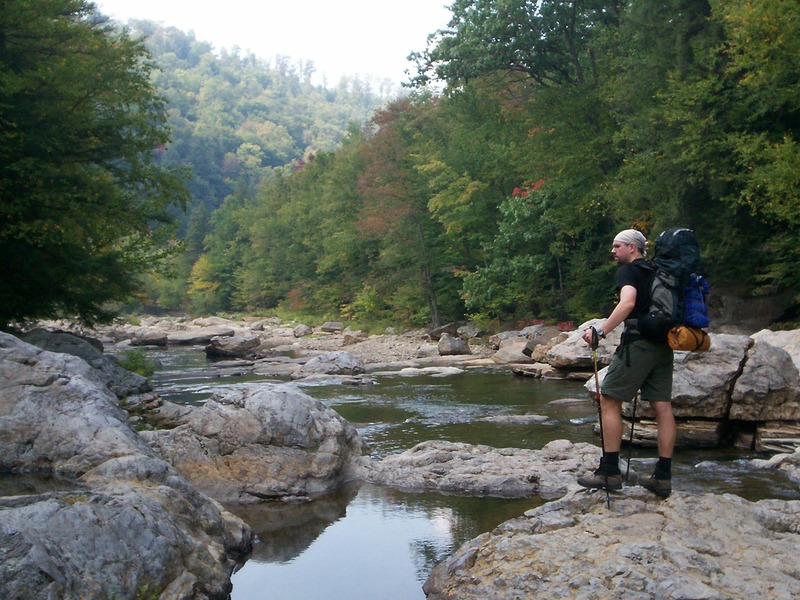 During 2005 and 2006, I had an insatiable appetite for Pennsylvania trails, and nearly every month I spent time hiking the Poconos or the Appalachian Trail or what’s called the Pennsylvania Wilds (the state’s northern tier). But as the years slipped into 2007 and 2008, jadedness set in. Last summer, I hiked the Pinnacle near Hamburg for the umpteenth time, and while that view of the Lehigh Valley has no peer in Pennsylvania, the trip had a worn-out feel. Maybe my trips to Ireland, Arizona and New Hampshire which opened new wilderness experiences had eclipsed any leftover enthusiasm for the ol’ Keystone State. If you’ve ever opened a folder of digital photos from years past for the first time in a long time, you’ve probably had something of a relapse of senses. That’s the experience I had this week. Looking at the West Rim Trail along Pennsylvania’s Pine Creek Gorge or peering at pics of snowy rocks at the Raven’s Horn brought back earthy smells and the giddiness of arriving at a canyon vista after rugged miles of a forest trail. Then I felt guilty for taking Pennsylvania for granted. This is a fine state for hiking. May not have the majesty of mountainous states like New Hampshire or Colorado, but Pennsylvania had its own brand of trail experience.